Levels of Discovery has designed the Princess Mini Rocking Chair to be fit for the littlest princess. Show her off in the picture frame on the backrest of this regally decorated mini-rocker! 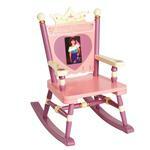 Special message on backrest "Always A Princess"
Crown and a 4" x 6" photo frame to honor your tiny Princess!